We were married in 2005 and after infertility, we have chosen to grow our family through adoption. Our love for each other has grown through our support for one another in this waiting process. We are excited to see God at work in the next chapter of our lives and to share our love with a child. We don't know when placement will happen, but hope it will be during 2019. 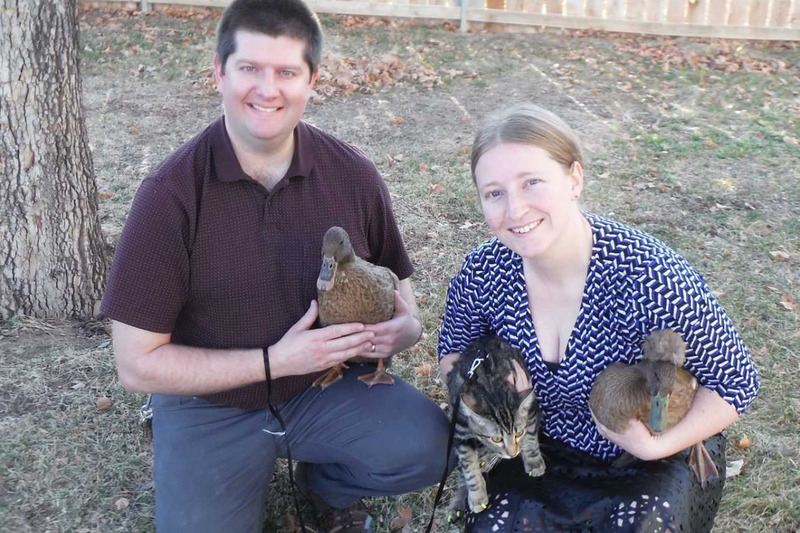 Our family currently has three unique pets, a cat and 2 ducks. Our cat is Lil’ Mac. He was born in the fall of 2017. It is so much fun playing with him! Mac likes to play with us, he even taught us to play fetch. He is great with other people and would love to have another family member to play with. The ducks, Corn and Jalapeño, live in the backyard. We have had them since 2011 when we picked them up from the hatchery. They like to swim and hunt for bugs. It is very entertaining to watch the ducks hunting crickets and flying bugs. We both grew up with pets and look forward to sharing our love of animals with our kids. We live in Western Colorado and enjoy the snow and outdoors. We hope to teach our children the same love of skiing and camping we have. Help us make our dream of adoption a reality by donating today! !